We welcome newbies! 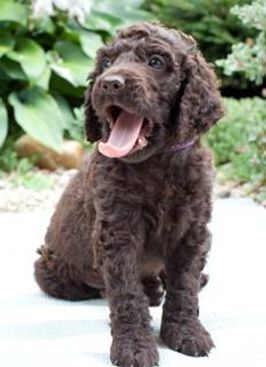 If this is your first Irish Water Spaniel, or if you are now ready to take your commitment to this rare and vulnerable breed to a new level, this is your page. 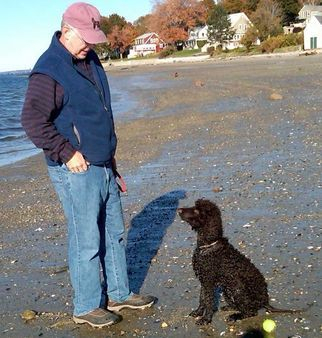 How can I help the Irish Water Spaniel? Owning one is a good place to start! Call one of our BEC breeders listed here to see if there are any owners in your region and/or pups available. Test your dog! Even if your dog is spayed or neutered, the single best thing you can do for this breed is to learn about the CHIC protocol and test your dog. This means getting an OFA-specific xray of your dog’s hips and elbows, and a CERF evaluation of its eyes, and an OFA evaluation of its thyroid. The results will be posted on the CHIC (Canine Health Information Center) website. This valuable information will help breeders ensure they breed only healthy dogs to healthy dogs. If all of this is Greek to you, go to the Home page to read more about CHIC and/or click here. Love your dog? CHIC your dog! Volunteer for a committee: Publicity, membership, specialty, newsletter, etc – if you have an inclination to volunteer, we have a committee for you. Become a Facebook friend of the IWSCA. Click here to say hello, post pictures of your dog, and see the photos of IWS owners around the world. Get involved in performance events! It’s a fun way to bond with your dog, engage your dog’s brain and give him/her a needed job to burn off IWS energy. It’s also fun to hang out with other IWS and dog enthusiasts. Dog shows, field hunting, agility, dock diving, obedience, therapy dogs, tracking… on and on! This is one of the most versatile breeds in the dog world. Ask the folks on the Rattails forum or call your breeder for information on how to get started. And read the wonderful story (below) about one man’s experience when he suddenly got “bitten” by the bug of competition! Remember: the more you put into your dog, the more you will get in return. Consider letting your breeder use your dog for future breedings. Talk to your breeder to see how you can make the ultimate commitment to the breed’s future! The IWS has a very small and vulnerable gene pool. We need more puppies from a diverse set of sires and dams. If your dog has passed his/her CHIC tests you hold the key to the future health of this breed. Talk to your breeder to see how she/he would mentor you in this undertaking. Read how an otherwise sensible and mature man gets bitten by the dog show bug… and ends up on the ride of his life. To read the entire wonderful story, click here. Do you have a “newbie” story to share? If so, send it to mdn2003@roadrunner.com for possible publication in the IWSCA newsletter.